Published By – Planet E Communications, Inc. Produced For – Luv Lite Rec. Copyright (c) – Crosstown Rebel Music Ltd. Licensed Through – Planet E Communications, Inc.
Packaged in a metal case with a cardboard outer sleeve. Fabric mix series is always fascinating. If you into detroit scene you should gives an ace one for this excelent mix .. top notch track selection . 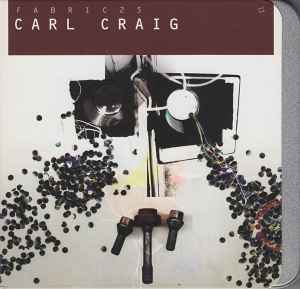 Carl Craig is one of electronic musics true pioneers and Detroits cult figure . Its a journey beyond the realm ! I find this a difficult cd to judge: track choice is excellent and original. As always, the mixing is flawless too. Overall it's a very funky and also chilled out cd to me. Which is exactly where I keep wondering: the voice-over thing that Carl Craig does is cool, but somehow I cannot figure out why he's 'shouting' into the mike...the tempo doesn't really seem to pick up, there's no fat beats coming in or tough break. I just can't imagine freaking out to such a laid back mix! One of the best fabric mixes so far.. Opening using the "whisper song" is genius..
A lot of the tracks Craig selected are very rythmically simple, but the mix is sure to get you moving. This cd is awesome, one of the best in the Fabric series (which i am a huge fan of) in my opinion. The mixing is great, the mix bounces along and the vocals, hand claps, and laughing that Carl Craig adds throughout the mix give it a feel unlike any other mix cd. The track selection is absolutely superb - there is not a single weak track on the cd. I knew that this cd would be good, from one of my favorite djs, but my already high expectations were completely blown away upon first listening to it. Easily the best mix cd of the year for me, in fact, one of the best i think i have ever heard.